Fit for the Journey: An American Company “Stepping Up! 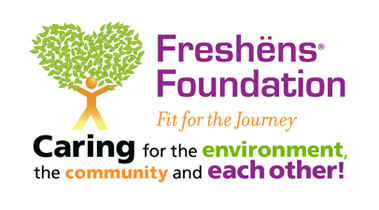 Established in 2004, the Freshens Foundation, “Fit for the Journey” was originally created to support local Atlanta Community Projects. Our Freshens employees and their families actively and successfully volunteered their time, and the Foundation contributed funds, into projects including The Center for Children and Young Adults, Earth Day, and the US City Fitness Program. the Founders of the company, John Stern, President, and his Father, Richard, CEO, a spry 89 year old retired Army Sergeant from WW II, advocated for a major change in the Foundation’s purpose. They recognized that our country’s heroes, the returning U. S. veterans and their Families, needed our support! The Foundation’s newly created goal is to prepare our Veterans and their Families to be “Fit for the Journey” for the rest of their lives. A multi-level financial program earmarks a percentage of profits generated from every case of proprietary products purchased by all Freshens locations on U.S. and foreign military installations to the Foundation. These funds will be used to support established Veteran programs, including The Fisher House Foundation. In addition, a special program has been developed to accelerate the growth of Freshëns locations on military installations by actively and aggressively promoting the ownership and operation of Freshëns units by our returning Military Veterans and their Families. With Freshëns Fresh Food Studio and its unmatched line-up of “Healthy and Good for you” proprietary products, which meet the highest rated nutritional qualifications of the Military’s new “Performance Triad”, our Veteran Operators will be able to offer a uniquely positioned Brand to Military installations for the very first time. “America’s Heroes and their Families’ will soon have the opportunity to own and operate a Freshëns location, as well as to offer for sale unmatched healthy food products in military environments. It is our sincere hope that the guiding principles of Freshëns “Fit for the Journey” initiative will become the standard for other National Brands to follow. Please join us with your support!